Hi guys! 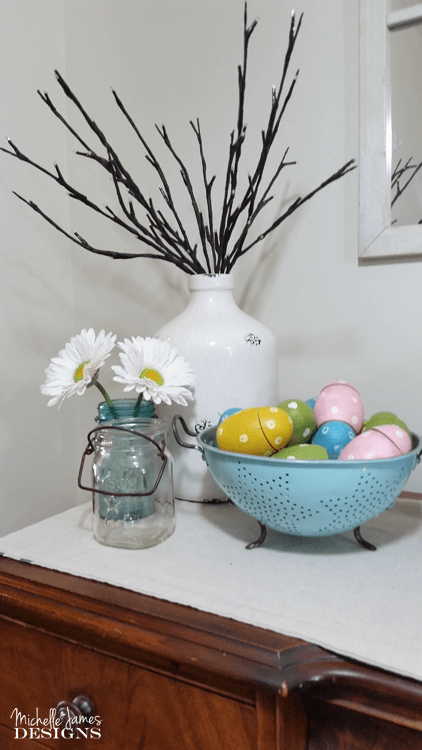 I have a great vintage colander upcycle that is so easy to transform and looks so pretty now. The cost was $1 and some paint I already had. 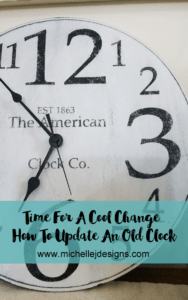 I was super excited to join this monthly Thrift Store Decor Upcycle Challenge. 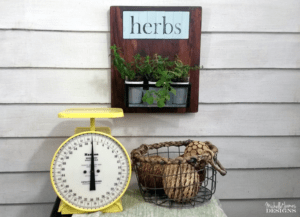 It consists of approximately 30 talented bloggers who are like me and love to upcycle thrift store items. I have to say this may be one of my favorite challenges out there. This colander came from the thrift store a while ago and it has just been sitting in the garage since. It was time to give it a new purpose and it is now part of my favorite decor items. I wanted the feet and the handles to stay old and a little rusted so it wouldn’t lose all of it’s vintage charm. I got out the frog tape and masked them off. It looked like an alien colander for a few minutes. Deciding on a color is always hard for me but I love teal and I love to add pops of teal in my decor. Since I had this paint already so I went with it. It is a Krylon product and the color is Blue Ocean Breeze. It is a glossy finish as well which is what I wanted. I placed it upside down and spray painted just the out side of the colander. It needed a couple of coats but came out looking exactly how I visioned it to be. 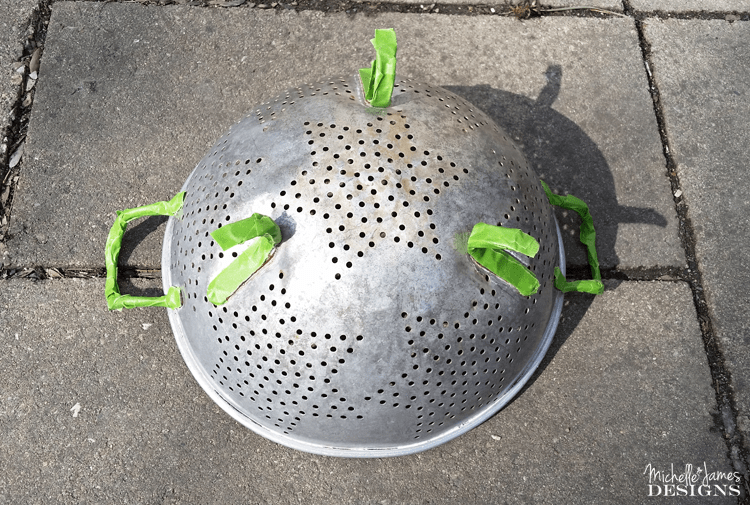 Once I removed the tape, I ended up with the perfect vintage colander bowl. I am so glad I didn’t paint the handles and feet because isn’t it cute? 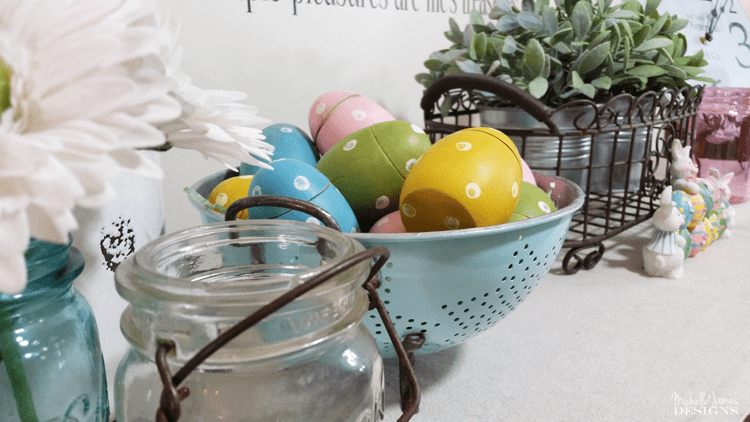 I think it turned out nice and it looks great with my Easter Eggs (be sure to stop back to see how I made the eggs)! If you like it be sure to pin it and save it for later! If you are pinning I would love for you to follow me on PInterest because it is fun! Hi Pili! Thanks so much. I love this color and could use it all year long. LOL! The eggs were a fun project and should be my next post! Have a great day. 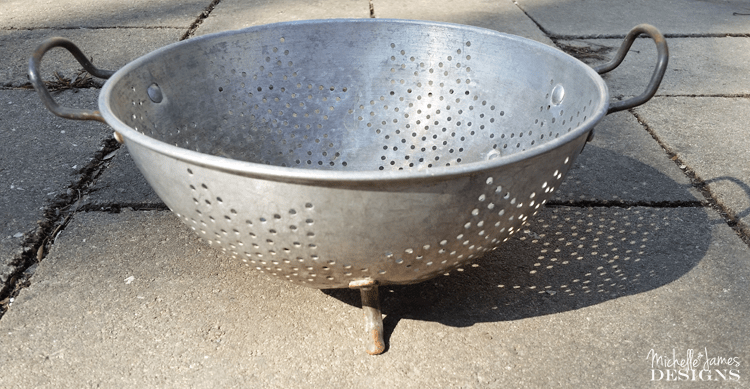 I think my mom had that exact (original) colander! Wonder if she still has it… Great and cute upcycle. Visiting from Thrift Store Upcycle. Hi Victoria. Is she still has it you should convince her to paint and upcycle it. It was so easy and fast. So very pretty (and even I can do this). I want to find an old colander (said like Veruca Salt). Omg that is funny. I can just Veruca saying that. I am glad you like it and hope you find one. Thank you. I think I was with you when you bought this, and you weren’t sure what you’d do with it. Well, this turned out LOVELY! 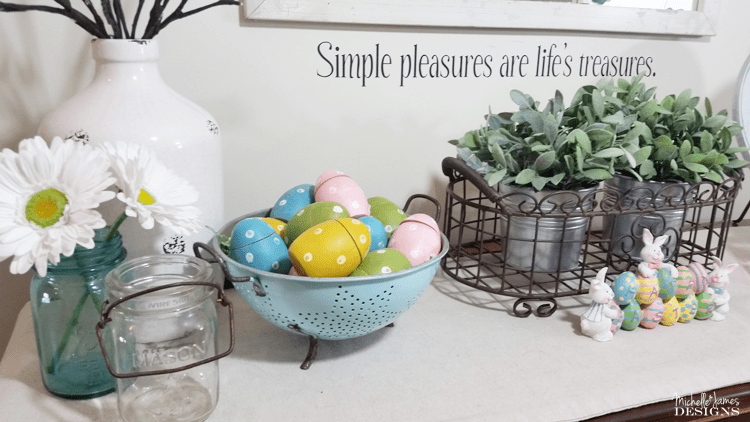 It’s the perfect spring decor, and I’ll bet you keep finding uses for it well after Easter! Hi Peggy. Yes I think I can keep using for most of the year. It’s Jeff’s fave color you know. 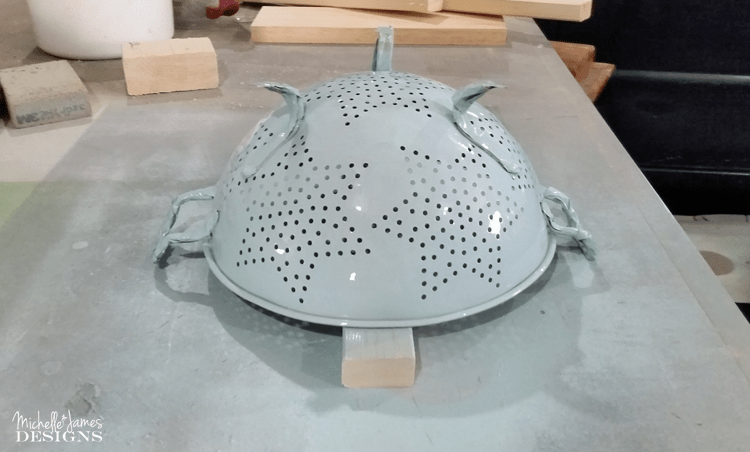 This vintage colander turned out great. I love that you kept the feet & handles vintage. You know the color is my favorite. 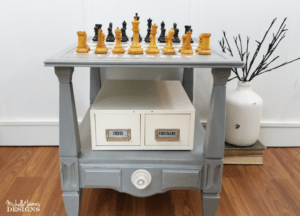 Great upcycle!! Hi. Thank you. I really wanted the contrast of the dark metal next to the teal. I do love it. Nice, but I would definitely paint the inside too, especially if it’s aluminum, which is what it looks like. Aluminum supposedly contributes to Alzheimers later in life. How cute! I remember those old colanders. What a great way to repurpose them! Hi Carolann! Thanks so much. I had if for a long time and almost forgot it was in the garage. I was so glad I found it because it is perfect for this. Love the color you chose. Very cute. Hi Denise. Thanks so much. The teal is one of my favorite colors but I have to use it somewhat sparingly since my husband hates it! LOL! Michelle, this is so pretty! 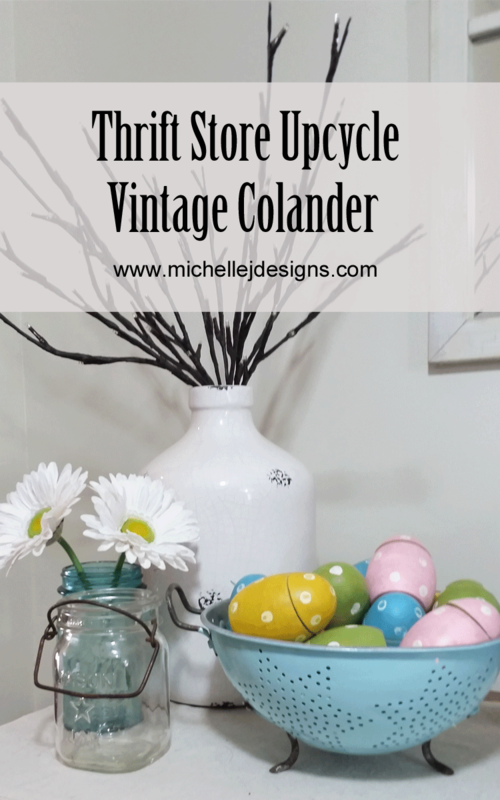 I love this idea for Easter and spring decor since it can be filled with any seasonal items. Pinning. Hi Sue! Thanks. It was so easy! I love how you kept the handles and feet original. Plus the color you painted it is so pretty. But the best thing is how useful you made it. I can see you using this all year round. Thank you. I really wanted some of the original peeking out from the teal and the feet and handles were perfect! I’ve got a colander just like this! I love that color you used! Hi Kim. Thanks I am in love with the teal! This is a clever idea. 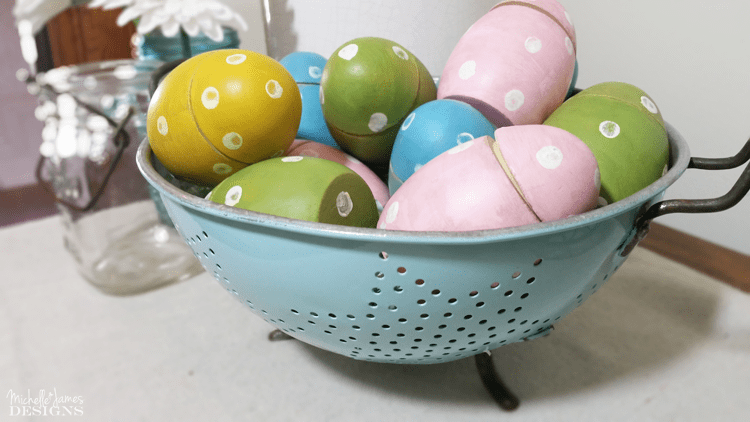 I always like the colorful colanders for decor, but never want to buy new — just for decor, haha!! This is a simple solution and cheap! I agree! I love the new, bright colors but old and cheap is definitely the way to go. LOL! Thank you Lora. Very pretty color! We had one like that when I was a kid! The stars! Great makeover! Hi Kim! The stars really say Christmas or July to me but I still went with the teal. LOL! I do love it though. Thanks for stopping by. Michelle this is so beautiful. I love that you kept the handle and feet old, what a great contrast! This will look great on your counter top all year long or hanging on the wall somewhere. I will now look at these old things in thrift stores with a new set of eyes. Hi Toni! Thank you. I do love to see other people’s thrift store up-cycles. I get some great ideas too. On the counter top is a great idea because I do have some pops of teal in the kitchen! LOVE how you updated this colander! We had an old one but I tossed it out because the legs were broken. Wish I had it now! Hi Ashley! Thank you. I think it was a fun find and I am kept pondering the color. I am so glad I chose the teal! Your colander brought back memories since my Mom had one just like it. I wish I had it. I am so very inspired by what you simply did with it by painting it a pretty blue. I just love it especially for Easter decor. Thanks Sue! I know it’s not the same as your mom’s but you will have to find one just like hers to paint and remember her. I love the color you chose and so glad you left the feet and handles. The old rust looks great next to the teal. Thanks Amanda. I love the color too! What an awesome challenge and you rocked it. Love how this colander turned out. So super cute. Thanks Anj! I love rockin’ it. I should paint a black one for you!